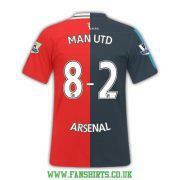 manutd 8-2 arsenal. . Images in the Manchester United club. This Manchester United icon contains ジャージ, tシャツ, ジャージー, and t シャツ.